Does your work involve sitting long hours? Prolong sitting without adequate support to your lower back or lumbar region in your executive chair is hazardous for your spine and puts lot of stress on the lower back. Low back pain is often a result of poor posture when sitting long hours. Lumbar support helps improve your sitting posture by maintaining the natural curvature of spine and supporting the lower back muscles. This avoids straining your back and keeping spinal injuries away. 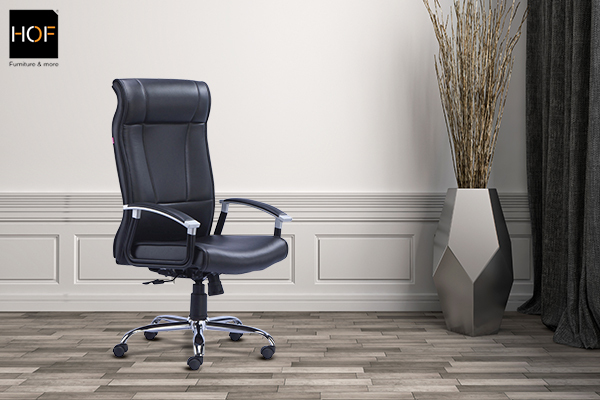 Together with lumbar support, a well-designed executive chair also offers adjustable headrest, and arm-rests that help relieve much of the stress on the lower back. Ergonomically advanced executive chairs from HOF feature different types of lumbar support and adjustable headrests and arm-rests like the 4-way adjustable lumbar support and 4-way mechanized headrest for better head support for best-in-class comfort. When seated, most of the body weight is transferred to the lower back which puts unwanted pressure on the back leading to chronic pain. The lumbar region (bottom five vertebrate in the spine) thus need to be supported to decrease the pressure on disc. 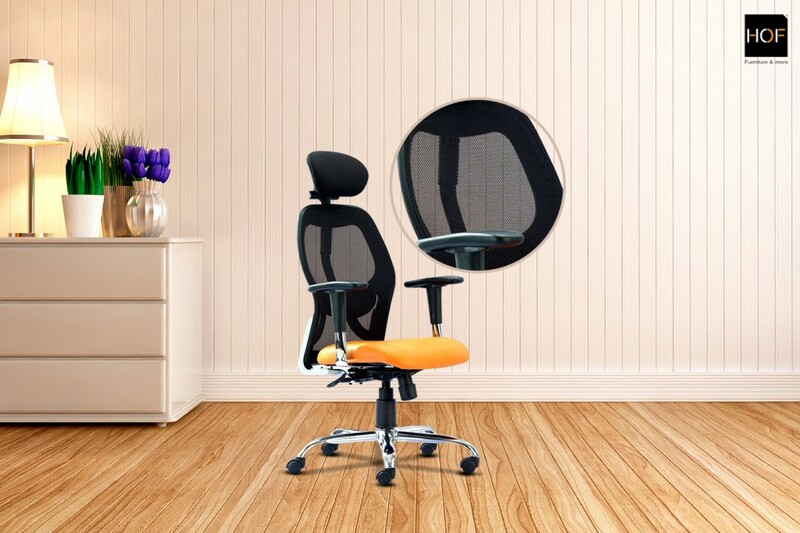 Therefore a office chair with seat back that inclines backwards and has a strong lumbar support is critical to prevent excessive pressure on low back so you have a comfortable seating. Here’s a quick look at the different types of lumbar support for executive chairs online. This is the most advanced and preferred type of lumbar support as it automatically adjusts to your change in posture while supporting your lower back. It helps properly align the shoulder, spine and helps maintain the inward curvature of the lower spine. The HOF Marco 1007 H is an excellent example of an executive chair with 4-way adjustable lumbar support and 4-way mechanized headrest for better for better posture and comfort. Adjustable headrest allows better flexibility and optimal support for your neck. These help avoid strain on neck and shoulder muscles when working long hours. While those on tighter budget may choose Marco 1001 H, multifunction chairs like Marco 1007 H offer special 4-way mechanized headrest. Adjustable armrests prevent shoulder strain and offers more customized comfort that translates into increased comfort. HOF offers Aluminum die-casted armrests with PU polished hand rests or veneer finish outer arms with cushion pad for better comfort and presence. The Marco 1005H is a great example of such a modern executive chair. Discover more such executive office chairs online with advanced ergonomic design at HOF and give your office an excellent makeover.